I would say that around 90% of the promotional videos that I have made, will end up on the internet at one point or another, with the most likely place being on your website. The best way to get it on there, is by uploading your video to a large site like YouTube or Vimeo and they provide you with a code that you can place on your site. I am no internet or web design specialist, so am sure there are other ways to get a video live on a website, but in my experience, using YouTube has been simple, quick and have never had a problem with YouTube crashing (despite the fact that 100 hours of video is uploaded every minute). Many people have started to favour Vimeo recently, but I still think that YouTube is the first place that people will go to to watch anything, so obviously an advantage to place your video where people are more likely to find it. So here is just a quick guide to getting a video clip from YouTube to your website and make it look as good as possible. Heading over to YouTube, first you need to do is locate the video that you need to place on your website. 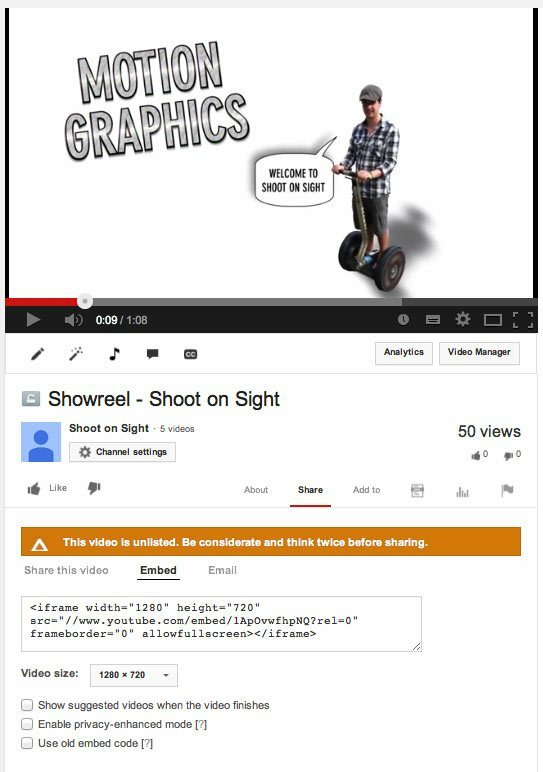 Underneath the video, you need to click where it says ‘Share’ and then further down where it says ‘Embed’, your screen should look pretty similar to this. The text that is located in the box beneath ‘Embed’ is all you need, simply copy this and paste it into where you want the video to appear. You can select your video size, I would leave this as the largest size that it allows for now, although you may need to manually alter it afterwards, to make it fit better on your webpage. Leave ‘show suggested videos’ un-ticked’. This will mean that after the video has finished, you don’t get bombarded with related videos to watch, I find this helpful, as you want your viewer to continue viewing your website, not be lured away by other videos. Your video should now be fully functional, if you have your YouTube account verified, you can also add a custom thumbnail for each video. Hope this was helpful for those of you that needed it, anymore questions that you have, please let me know.